Seeing the stock price slipping more than 47% since February, the managers of Majestic Gold Corp. (CVE:MJS), (PINK:MJGCF) decided to undertake measures against this unpleasant trend. They tried to boost the shares with two paid promotions yesterday. So far, there is a result from the advertising activity and the stock advanced on the markets. Though, it is not clear whether the positive promotional effect will last in the long run, or it will be just temporary. During the last session on the TSX Venture Exchange (CVE), the shares moved 13% up on a volume of almost 2M, which exceeds twice the average. Similar rise occurred on the American OTC market, where MJGCF also gained approximately 13%. In addition, the stock marked a record turnover of 391K shares traded. These figures do not speak in favor of a future rise of the share price. 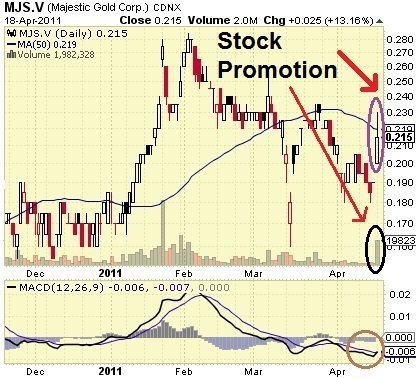 Besides, Majestic looks overvalued by traders at present. Its market value of $107M is four times larger than the net worth of the business which, according to the financial statements, is $27M. On the other hand, there are favorable facts that might aid the shares climb in the future. Majestic's financial condition is stable enough with $4.9M in cash and a working capital of $3.76M in the end of 2010. Its principal deposit, the Songjiagou Gold project in China, seems with a huge potential - the company claims a mine-life of 22 years, payback in just 1.4 years and 78.6% internal rate of return. Nevertheless, Majestic's directors will have to make further efforts, apart from the promotional campaign, for the company to continue operating as a going concern with no troubles. As the corporation admits in its financial reports, it "will need to raise additional funds for working capital and for carrying out its planned exploration, development, operational activities".